There’s been a ton of new interest in better and improved sumps for reef aquariums over the last couple of years. There’s been so many new sumps and designs introduced lately, we decided to put together this nice synopsis of how many companies are taking sump designs to the next level. After what seemed like a decade of stagnation in the aquarium sump space, all of a sudden we’re seeing a renaissance of new sump designs which range from the very refined, to the high end, the compact nano sump to the commercial grade sump. Whatever kind of sump you are interested in, there’s now a ready-made solution with the level of features and accessories for every level of reef hobbyist. The Royal Exclusiv Nano Dreambox is the turbo-charge sump that may not have started this renaissance of new sumps and designs, but it certainly was first in line and is still the leader of this new breed of under tank filtration. Being the only injection-molded sumps on this list, the Seamless Sumps by Custom Aquariums are completely in a league of their own. The sturdy molded Seamless Sumps may not be the best looking on the block, but their seamless construction ensures that they will offer many many years of services with no spills or floods. The Tideline Series sumps from Trigger Systems are another no-frills, stripped down sump offering. The draining water is processed through an enclosed area for pre-filtration to reduce noise and salt creep, and there’s plenty of space left over for locating the refugium, skimmer and other filtration accessories. Aquarium Specialty’s Biotek sumps are yet another novel approach to enclosing the reef sump package in a very attractive design with heavy duty construction. We haven’t yet seen one in person or in action, but we are told these should start becoming available very soon. Eshopps has a great thing on their hands with the new Cube Nano Refugium line. The unique Channel Design that routes water under and in between chambers is also skillfully employed on their larger sumps and we’re bound to see these powering some great reef tanks in the future. NextReef sumps are no frills, simple utilitarian sumps that really enable reefers to build a great reef aquarium filter from the ground up. There’s plenty of open space to fit a large base protein skimmer, as well as a bevy of assorted accessories and media filters. The Transformer Sump is a creation of our own design, made for us by Fluid Engineers. While still a one-off, this sump design really deserves to be replicated for all the people who wish they could fit a bigger skimmer under their short stands. Building an Obsession was the first new AcrylicSmithing outfit to offer a very simple yet elegant new sump design for smaller tanks without breaking the bank. We love BAO’s style and can’t wait to see what they’ll release in the future. Vertex sumps are in the same league as the Dreamboxes with a fusion of both acrylic and PVC panels, plenty of heay duty plastic welding, and lots of highly refined placements for all the drains, returns, dosing lines and probe holders. MyReefCreations iSeries sumps are the gold standard in heavy duty aquarium filtration design, and there’s currently no contender when you need a commercial grade installation. Last but certainly not least, the Seadreams sump from Reef Water is a work of art unto itself. 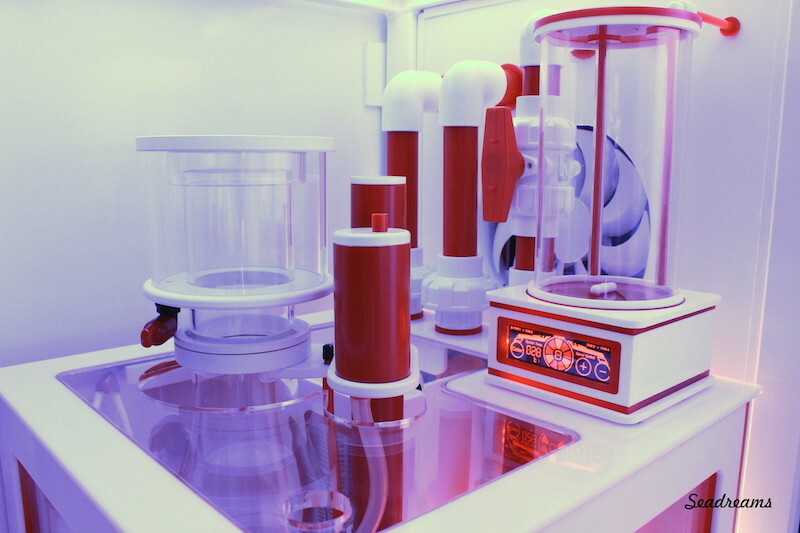 We love the excessive use of LED accent lighting and we still have to get the scoop on that magnetic stirrer powered kalk reactor.